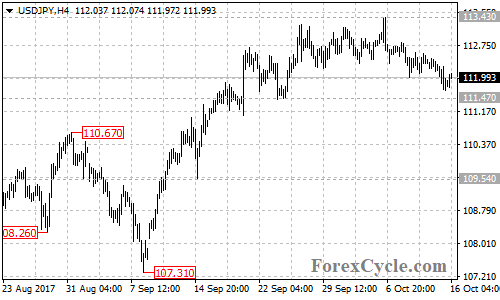 USDJPY extended its downside movement from 113.43 to as low as 111.68. Deeper decline to test 111.47 key support is still possible. As long as this level holds, the fall could be treated as consolidation of the uptrend from 107.31 and another rise towards 115.50 is still possible after the consolidation. Near term resistance is at 112.60, followed by 113.43, above these levels could signal resumption of the uptrend. On the downside, a breakdown below 111.47 support will confirm that the uptrend had completed at 113.43 already, then the following downside movement could bring price back to 109.50 area.